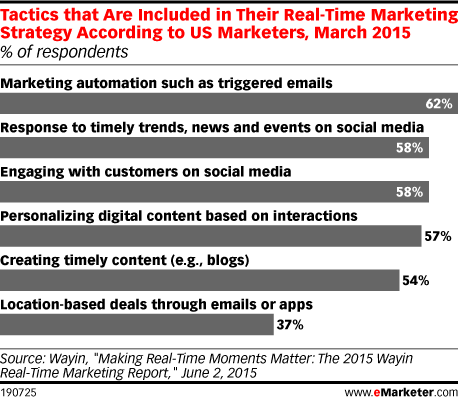 Data is from the June 2015 Wayin "Making Real-Time Moments Matter: The 2015 Wayin Real-Time Marketing Report." 200 US marketers were surveyed in March 2015. All respondents currently practice real-time marketing at companies with $100 million or more in revenues. Respondents identified their job levels as C-level executive (26%), director (25%), manager (20%) and VP (30%). Respondents identified their industry as agencies & consulting (21%), brands (79%), media & publishing (4%), nonprofit (1%), sports (1%) and other (3%). Wayin is a social media analytics and display company.